As someone who has struggled with almost every variation of acne, from a few small whiteheads to large painful cysts, I’ve done a lot of research over the years on the best ways to fight it. Unfortunately for me, my acne never drastically decreased until I went on my first treatment of Roaccutane, but throughout my research I did occasionally find something that helped my skin in some way, even if it was only minimal. I thought today I would share five of my own tips that have helped me the most in my skincare journey, in the hope that they might help someone else who is struggling to get control over their skin! DO NOT OVERWASH... For a long time, I didn't realise that I was doing more harm than good when it came to washing my face. Not only would I wash my face too much, I would combine that wish washing too vigorously in a vain attempt to scrub the spots off my face, and I would also use products that turned out to be far too harsh for my skin type. All of these factors combined resulted in my skin being dry, stripped of oils, and aggravated, which only made my acne worse! Now, I wash my face gently, once in the morning and once in the evening, using products that won't strip my skin or irritate it. If your face is bright red and sensitive after it's been washes, something in your routine is far too harsh for your skin! LEARN YOUR SKIN TYPE... In order to know which products may be too harsh/not harsh enough, it's important to know your skin type! Mine has changed a lot over the years, especially with the two drug treatments I've been on, but right now it's settled at combination to dry, with my t-zone getting slightly oily throughout the day. If you have quite oily, spot print skin and you're using an intensive moisturiser, chances are it may be too much for your skin. There are quite a few websites a simple google will find, that allow you to answer some simple questions and find out a general idea of what skin type you fall under. This should help you choose the best possible products for you skin! HAVE MAKEUP FREE DAYS... When you have acne, it can be incredibly difficult to go bare-faced. When mine was at its worst, there were some days where I wouldn't leave the house, even with a face full of makeup, because nothing could conceal the spots on my face. Even now that my skin is fairly clear, I would still find it incredibly difficult to leave the house with no makeup on, so I think it's silly to tell someone with acne to simple stop wearing as much makeup. But, wherever you can, whenever you can, try to go makeup free. If you're staying home for the day and know you won't have to see anyone, stay natural for the day. It's important that you give your pores a break from the layers of makeup, and for days where you will be wearing makeup, try to use non-comedogenic products. The ingredients in these products are less likely to clog your pores than standard makeup products so if you really can't face going makeup free, give this option a try. STOP TOUCHING YOUR FACE... This is something that I still struggle with, even though I how important it is. I just don't realise that I'm leaning on my face, rubbing my forehead, or just messing with my face until it's too late. I always stop when I do realise, but I definitely need to get into the habit of keeping my hands well away from my face. Our hands pick up so many germs throughout the day, and when we touch our face we transfer those germs to our skin and our spots. Try to carry around a hand sanitiser to keep your hands cleaner throughout the day so that if you do happen to subconsciously touch your face, it's not as bad as I could've been! IF ONE PRODUCT DOESN'T WORK, KEEP GOING AND TRY ANOTHER... When you're fighting acne, there might come a point where you feel like you've tried every single product out there and nothing is working. Keep going! Products need a couple of months to truly show a difference to your skin, and if they fail then it's important to keep trying new products until you find something that works. 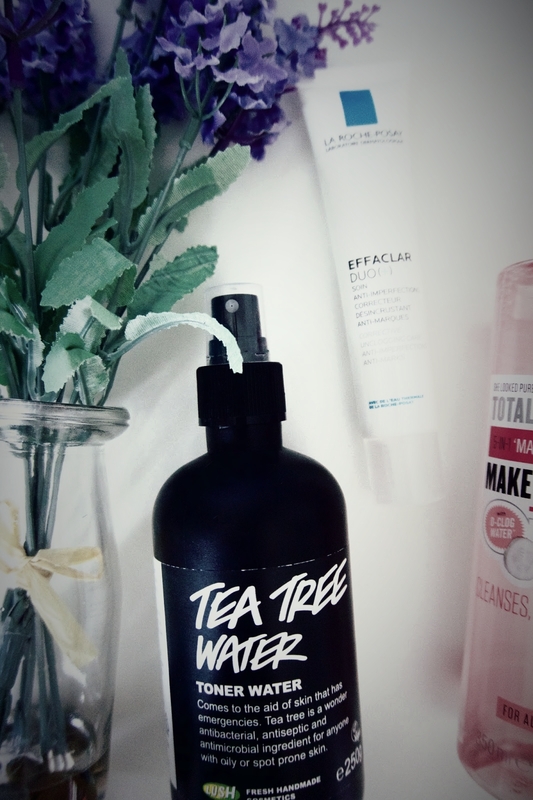 I went through countless products that all claimed they would clear my skin and ended up making little to no difference, until I eventually found my two holy grail products, Lush Tea Tree Toner and La Roche Posay Effaclar Duo. You will find a product that helps you, you just have to keep searching until you do! Do you have any tips for acne sufferers? Oh my gosh, the first tip, YES YES YES! My skin has improved so much ever since I only started washing my face with a cleanser once a day before I go to bed. Since I started washing my face once a day, my acne has cleared up so much! All such great tips- especially the first one! I wish I knew how much better being gentle with your skin is, back when I was struggling with acne. It makes such a difference, gentle is definitely the way to go! I have never been one to suffer with acne, I am relatively lucky when it comes to my skin. 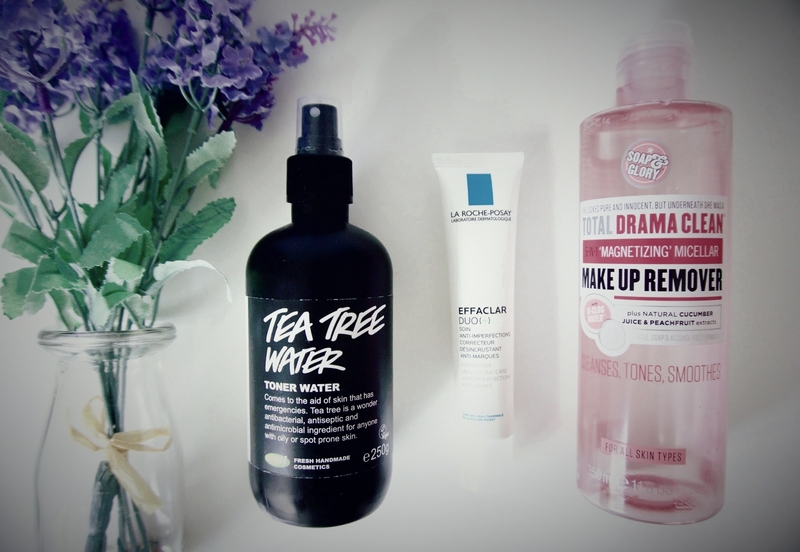 But, I have been trying to make more of an effort to look after my skin and have some form of skincare routine. I am going to have to try and find the Soap and Glory Cleanser!